Hydra Natural Glide is a premium natural water and plant cellulose-based lubricant formulated for smoothness and comfort. Hydra is a pure non-toxic personal lubricant, entirely glycerin and paraben free, infused with certified organic extracts. 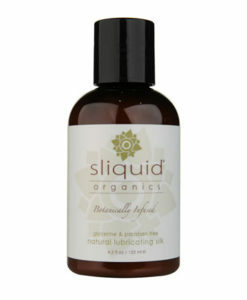 This 240 ml (8oz) super economy size squeezable bottle is an affordable option for premium lubricant. What is Hydra Natural Glide? 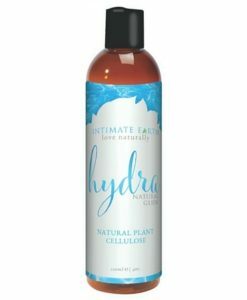 Hydra Natural Glide is a premium natural water and plant cellulose-based lubricant.This pure non-toxic personal lubricant is infused with certified organic extracts. Hydra is formulated especially for delicate intimate areas and comes from the Intimate OrganicsTM range of organic natural lubricants by Intimate Earth. This super economy saver size 240 ml (8oz) size is a squeezable bottle with convenient dispenser lid. Who is Hydra Suited to? Hydra is suited to women seeking a healthy nourishing water-based lube with a smooth consistency and no sticky residue. This water based lubricant is an ideal alternative for women seeking to avoid the harmful chemicals common to many personal lubricants. Water based lubricant is well known as one of the safest personal lubricants for the body. Water-based lubricants help women avoid tissue irritation and infection that has been linked to some of the oil and petroleum-based lubricants. Hydra Natural Glide is available in 3 sizes; 60 ml purse pack, economy 120 ml and super-economy 240 ml squeezable bottles. 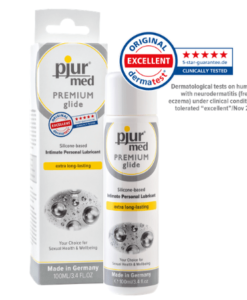 Aqua, Propylene Glycol, Hydroxyethylcellulose, Methylisothiazolinone (and) Phenethyl Alcohol (and) PPG-2-Methyl Ether, Water (and) Alcohol (and) Certified Organic Lycium Barbarum (Goji Berry) Fruit Extract (and) Certified Organic Cymbopogon Schoenanthus (Lemon Grass) Leaf/Stem Extract (and) Certified Organic Aloe Barbadensis (Aloe) Leaf Extract.